I’m sure most people will agree that there are few fashion challenges harder than finding the perfect pair of jeans. The search for a pair that fits, let alone looks good, can sometimes feel like looking for that ever-elusive needle. Even when you strike gold and find a pair that’s Beyonce babelicious, there’s almost always a catch. Like, have you checked the price tag? Will they survive the test of time? Can you sit down? Hang on, can you breathe?? Such was my experience buying jeans until, by happenstance, I discovered A.P.C.’s Petite Standard. I remember our first encounter like it was yesterday. I’d just finished an amazing coffee at San Francisco’s Four Barrel on Valencia Street and in a holiday daze, wandered into No Shop, a second-hand clothes store two doors down. They were hanging on a rack out the back, as new and on offer at $60. It was love at first sight. I’ve since learned that A.P.C. has a loyal following of denim devotees – and for good reason. My first pair of A.P.C.s travelled with me from Nicaragua to New York to the Netherlands. They were the only bottoms in my backpack and one year later, they’re still going strong. In fact, these jeans just get better with time. They’re old school unwashed raw denim selvage – a dark indigo, stiff, heavy fabric that with wear and washing transforms into a beautifully uneven grey blue patchwork quilt of whiskers, creases, faded patches and frayed edges. I’d never cared to notice denim’s process of ageing before but when my A.P.C.s arrived on the scene, I began to pay attention. Now, with my second pair, I’m experimenting with a slightly less extreme version of A.P.C.’s Extremist Denim Washing Recipe (see below). I survived 1 month without washing – a little gross I know, although not as bad as the diehards who hold out for 6. I’m now on my second wash-free month and they’re looking lovely. So, if you’re one of the thousands out there who are still searching for the perfect pair of blue jeans, I can’t recommend these enough. They’re stylish, comfortable, hard wearing, reasonably priced and fit like a glove. Perfect. This entry was posted in Cities, Covet and tagged covet, natalia. I own two A.P.C. jeans and they are all that I wear. I’ve sold/given away my other jeans. So I totally second this post. I’ve recently started buying eco denim. It’s a bit of a splurge, but the jeans feel incredible and it’s nice to know that they’re a little better for the environment. I also read that APC has a program where they let customers trade in their worn jeans and buy a new pair. They then patch up the old jeans and re-sell them as “pre-worn” denim. I love all of these different ideas for reducing our footprint from fashion. @Cindy, I know – aren’t they the best?! @Camilla, what’s eco denim? Do they use a different dyeing process? “Eco denim” refers to some combination of organic cotton, natural dyes, nontoxic chemicals for the fading process, less water, fair trade, and ethical labor practices. I’m wearing a pair of AG eco-denim jeans right now. 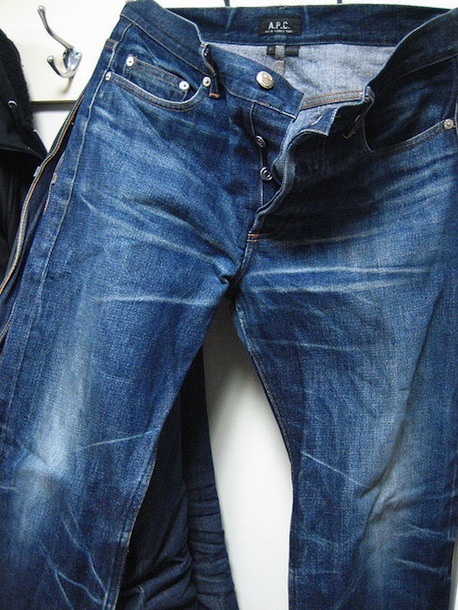 http://www.onearth.org/article/how-green-are-your-jeans << more info about eco denim. I need to get some APC jeans! The last time I bought a pair of jeans, the shop assistant advised me never to wash them, but to put them in the freezer for a few days every couple of months. I didn’t follow her advice. My freezer is too small and I’m not sure it’s so hygenic.